This is not just SharePoint 2016 related. The same thing happens also with the patches of the previous version of SharePoint (2013) if the package download is incomplete. In very short, I encountered this failed installation message when I recently was patching a SharePoint 2016 farm, but the issue wasn’t that obvious. Compared with the SharePoint 2013 patch files, the SharePoint 2016 package is smaller (so far is a single file 🙂 ) and that’s why was not obvious to me the reason why the patching installation failed. This was the file I initially used to run as part of September SP2016 CU patch. If you pay attention to the size of this file you see is not that big (around 56 MB). The Cumulative Update contains all the previous patches (part also on the previous Cumulative Updates), plus the recent releases. How is possible to be just 56 MB in size? I remember the August CU was a couple of hundreds MB in size. 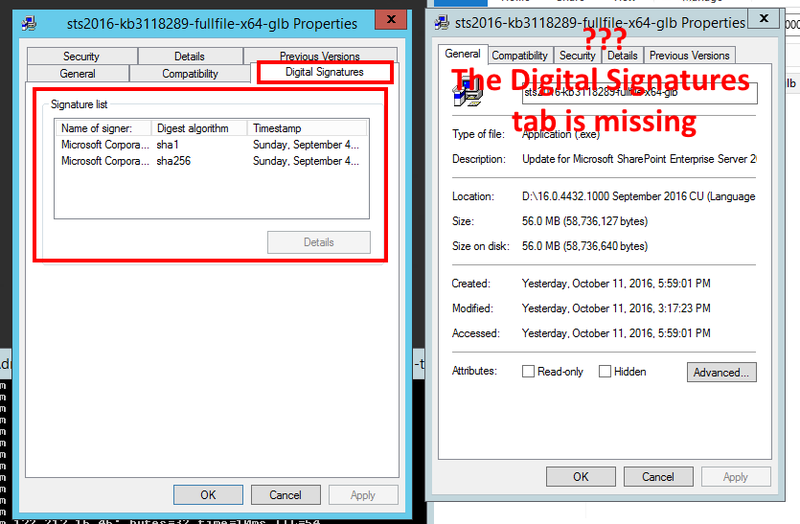 I downloaded again the SP 2016 September CU patch (sts2016-kb3118289-fullfile-x64-glb.exe) and noticed the latest download is in size of 346 MB. Of course, the installation using the 346 MB package worked well. 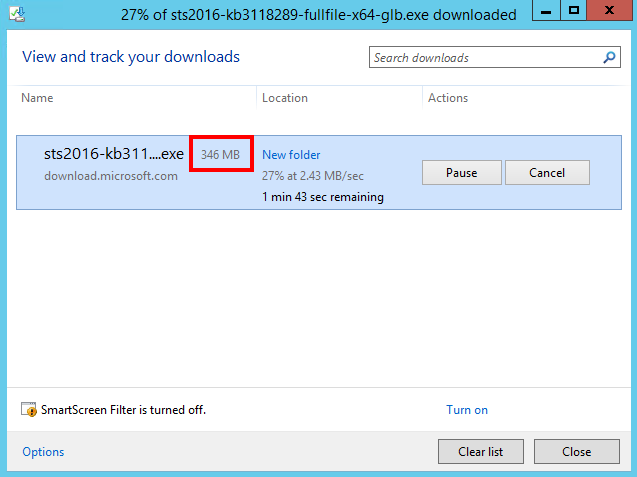 But, how was possible to download the patch file from the Microsoft site and the file end up being in size of 56 MB for the first download and 346 MB for the second one? How can I check if I get the full patch file? I tried the download multiple times and finally I was able to encounter the issue again. The learning here is when you start to download the file, the download manager will tell you what is the total size of the file is about to save locally. Make sure when the file download is finished you compare the file sizes (the one mentioned by the download manager and the actual size of the downloaded file). Another thing to pay attention too is when the downloaded patch EXE file doesn’t include the digital signature -> the Microsoft patch files contain digital signatures. 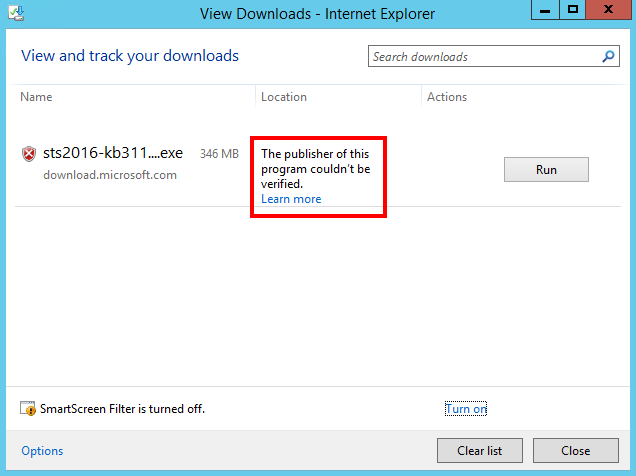 The impossibility of the download manager to verify the signature is again a sign of incomplete download. In the above picture, on the left, I have the properties of the 346 MB file and on the right side, I have the properties of the 56 MB file. So, keep in mind, when you encounter “The installation of the package failed” message immediately after you trigger the patch installation, there are big chances your patch file to not be completely / correctly downloaded. I so far haven’t investigated the reasons why the incomplete download happens.